By combining learning objectives and the Wienermobile, I had a memorable teaching experience! 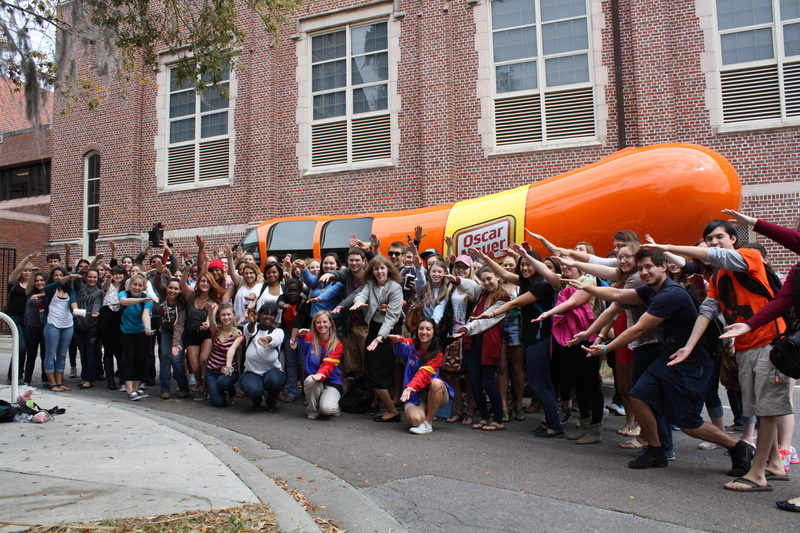 When I received the email blast that the Wienermobile was going to be visiting the University of Florida campus to recruit students to work as brand ambassadors for Oscar Mayer, I looked at the course syllabus to see how the Wienermobile’s timing corresponded with what we had scheduled in class. 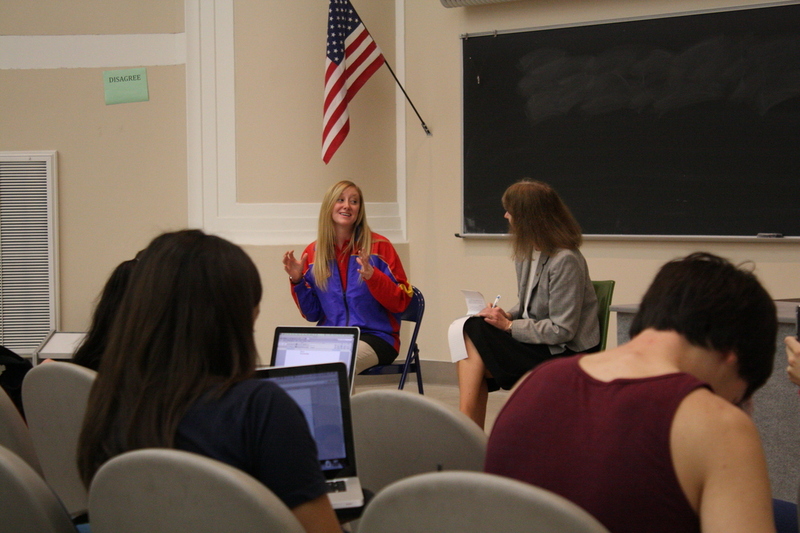 A series of emails with Hotdogger Holly Nelson led to Holly and her Wienermobile partner Lisa Rosenblum being guests in my Multimedia Writing class. 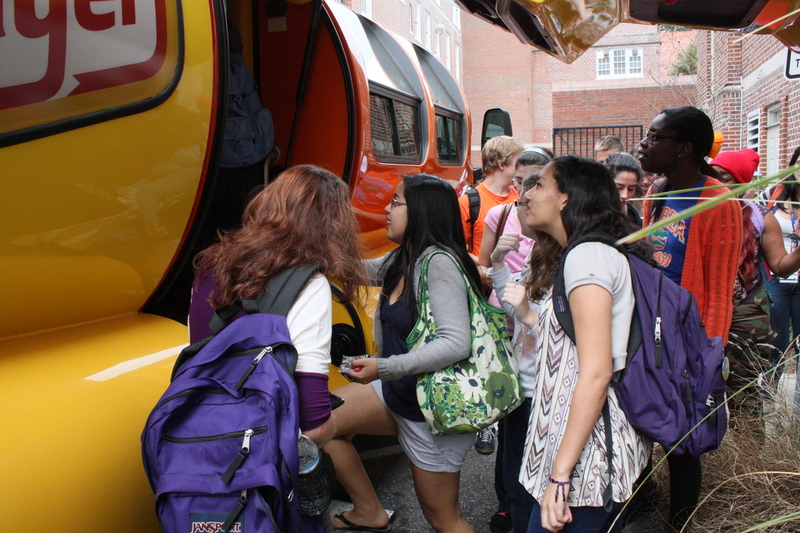 So how did the Wienermobile help my students learning? #1 – An interview with a Wienermobile Hotdogger helped the students learn about interviewing, notetaking and profile writing. One of the goals of the course is for students to learn how to conduct interviews and take notes in order to write a news story, a news release, a blog post, etc. We were just to the introduction to interviewing part of the course when the Wienermobile was rolling onto campus. Students had the opportunity to observe an interview and to practice notetaking when I interviewed Hotdogger Holly Nelson in class. Holly, my Weinermobile contact, and I worked out through email that I would interview her in class. The students not only would watch the interview to learn about interviewing but would take notes and write a profile about Holly’s work as a brand ambassador for Oscar Mayer. During the interview, the students were busily taking notes – with paper and pen or with their laptops. Several of the students were recording the interview, but they had the directions to always take notes, too. Based on the interview, the students wrote a profile of Holly. The process of watching the interview, taking notes and writing the profile of Holly helped the students be prepared for the assignment the next week when they had to interview a classmate and write a profile. #2 – The work of the Wienermobile Hotdoggers helped the students see the skills needed for a media-related job or internship. Most of the students in Multimedia Writing are sophomores and juniors, and most are moving through the process of deciding how they would use their media skills in an internship or job. 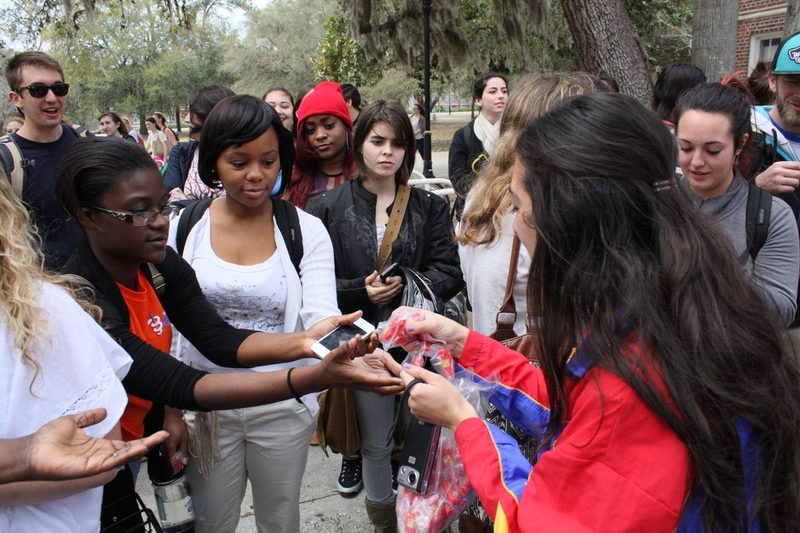 Hotdogger Lisa Rosenblum distributed Wienermobile whistles to the students in Multimedia Writing when they visited the Wienermobile after class. Both Holly and her Hotdogger partner Lisa had just completed their college degrees and talked about their own college degrees and how the one-year job with the Wienermobile was helping them develop skills and experiences that will help them in obtaining their next jobs. In the interview with Holly, the students learned that she had a double major in Communications and Spanish and a minor in Journalism from the University of Minnesota, Duluth. Holly’s Spanish ability has been useful in her work with the Wienermobile and interacting with literally thousands of people over the last seven month. The students heard that working as a brand ambassador involves writing news releases, making media contacts, being interviewed by broadcast media, tweeting, and contributing to the Hotdogger Blog. It was useful for the students to know the kinds of skills they might need in entry-level jobs when they graduate. #3 – The work of the Wienermobile Hotdoggers showed that a job right out of college can have a great deal of responsibility. Holly said that she couldn’t imagine a future job that would ever have her coming into contact with so many people – and so many people happy to see her – as her job with the Wienermobile. Students in Multimedia Writing checked out the interior of the Wienermobile. The seats are ketchup and mustard colors. The ceiling is blue with white clouds. But the class and I both heard and saw the responsibilities involved, too. “Sometimes it’s just the two of you (the Hotdogger team) and the Wienermobile,” Holly said, as she discussed the responsibilities of the Hotdoggers – setting up campus visits and media contacts, checking in with Oscar Mayer headquarters for scheduled events, and driving and maintaining the Wienermobile. Learning to drive and maintain the 27-foot-long and 11-foot-high Weinermobile is part of the two-week Hotdogger training. As the class and I gathered by the Wienermobile after class for a group photo, I could see that many of us were thinking about what would be involved in being responsible for the Wienermobile. Just after the group photo and a tour of the inside of the Wienermobile, a light rain started. “Do you need a ride back to the college,” Lisa asked me, as I was teaching in a classroom about a half mile from my college. “That would be great,” I said, realizing that I was going to get to ride in the Wienermobile. With some directing help from Holly, Lisa executed a three-point turn in a small parking lot, and then we were driving across campus. Students who were quietly standing at bus stops broke into wide smiles and waved as we drove by. People dropped their books to pull out their phones from pockets or purses to get a photo of the Wienermobile. Learning and fun – a great combination for the students, me and the Hotdoggers.